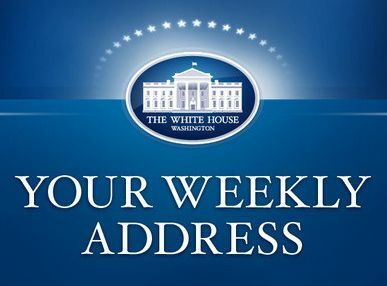 WASHINGTON, DC -- In this week’s address, the President reiterated the forceful and optimistic message of American leadership that he delivered in his speech before the United Nations General Assembly earlier this week. America is leading the world against the most pressing challenges, including the fight to degrade and destroy ISIL, the effort to stop the Ebola epidemic, and the movement to confront the threat from climate change. The world looks to America and its commitment to freedom in the face of uncertainly, and as the President said, it will continue to do so for generations to come. America is leading the world in the fight to degrade and ultimately destroy the terrorist group known as ISIL. On Monday, our brave men and women in uniform began air strikes against ISIL targets in Syria. And they weren’t alone. I made it clear that America would act as part of a broad coalition, and we were joined in this action by friends and partners, including Arab nations. At the United Nations in New York, I worked to build more support for this coalition; to cut off terrorist financing; and to stop the flow of foreign fighters into and out of that region. And in my address to the UN, I challenged the world -- especially Muslim communities – to reject the ideology of violent extremism, and to do more to tap the extraordinary potential of their young people. America is leading the fight to contain and combat the Ebola epidemic in West Africa. We’re deploying our doctors and scientists -- supported by our military -- to help corral the outbreak and pursue new treatments. From the United Kingdom and Germany to France and Senegal, other nations are stepping up their efforts, too, sending money, supplies, and personnel. And we will continue to rally other countries to join us in making concrete commitments to fight this disease, and enhance global health security for the long-term. America is engaging more partners and allies than ever to confront the growing threat of climate change before it’s too late. We’re doing our part, and helping developing nations do theirs. At home, we’ve invested in clean energy, cut carbon pollution, and created new jobs in the process. Abroad, our climate assistance now reaches more than 120 nations. And on Tuesday, I called on every nation – developed and developing alike -- to join us in this effort for the sake of future generations.